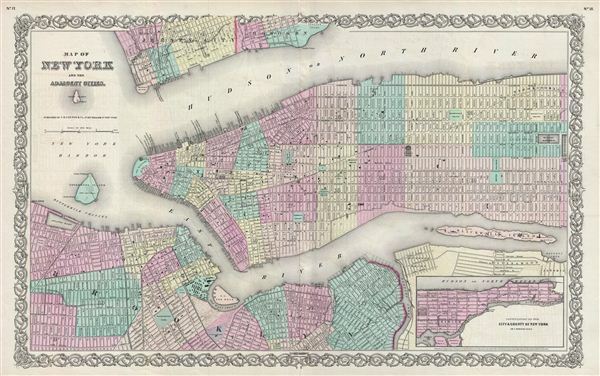 A rare and beautiful example of J. H. Colton's 1856 map of New York City and vicinity, including Manhattan as well as parts of Brooklyn, Jersey City, Hoboken, and Queens. This is the first edition, first state, of the Colton New York City atlas map in which Olmstead's Central Park is completely absent. This important map would become the template from which Johnson and late later S. A. Mitchell Jr. would build their own New York City maps. The year 1855 in New York City witnessed the inauguration of Fernando Wood, New York's first mayor from Tammany Hall, an increasingly corrupt institution that would rise dominate regional politics for the remainder of the 19th century. Meanwhile, across the east River, Brooklyn annexed Bushwick and Williamsburg becoming, in the process, the third largest city in the United States and setting the stage for Brooklyn's consolidation into the modern New York City in 1898. Features beautiful hand color according to city wards. Wonderful attention to detail includes individual streets and even important buildings and parks. Prepared by G. W. Colton as plates no 17 and 18 in J. H. Colton's 1856 single volume issue of the Atlas of the World. Dated and copyrighted: 'entered according to the Act of Congress in the Year of 1855 by J. H. Colton & Co. in the Clerk's Office of the District Court of the United States for the Southern District of New York.' Published from Colton's 172 William Street office in New York.